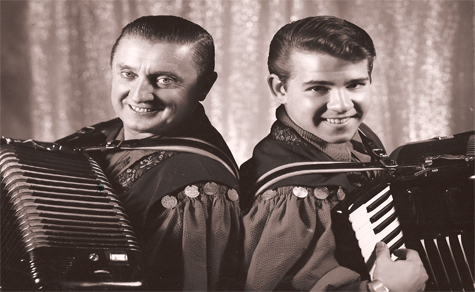 Cleveland isn't just the rock & roll capitol of the world, it's also the polka capitol. The variety of polka that came out of Cleveland took on its distinctive flavor thanks to the city's large population of Slovenian immigrants. They brought the music of their native country with them, but soon started blending it with elements of jazz, country, blues and ragtime to create what would become known as Slovenian polka. Produced for Slovenian television, POLKA! THE MOVIE delves into the musical history of those who left the motherland for Cleveland, with writer Joe Valencic as our guide. It makes for an interesting slant seeing an “outsider” researching Cleveland's musical past. I wonder how many Clevelander's even know about this aspect of their town, which at one point in time produced million selling records from hometown heroes like Frankie Yankovic. Cleveland is even home to the Polka Hall of Fame (housed in a shared building with the Softball Hall of Fame), but how many of us have visited? Valencic has, and he also goes to Collinwood and the area around St. Clair and Harrison, once the heart of Cleveland's Slovenian community, to talk to those who remain and still remember. Like the music it celebrates, POLKA! THE MOVIE is filled with joy and good will. It also provides a glimmer of hope that polka will continue to survive, showing us that younger musicians like 20 year old Johnny Koenig continue to carry the torch for classic Cleveland polka artists like Yankovic and The Vadnals, while veterans like Joey Miskulin are doing better than ever playing accordion with U2 and Shania Twain and contributing to the soundtracks of Disney films. As rich as the material here is, director Duran Moravec just doesn't have that strong of a grasp on filmmaking. The editing could really have used some tightening up - there's way too much time spent on establishing shots and random bits of local flavor, and Valencic keeps listing off the names of Slovenian businesses that used to occupy Cleveland storefronts long after the point has been made. Also, while the outsider perspective is interesting, a local filmmaker would have known the importance of Cleveland TV shows like Polka Varieties which aired on WEWS channel 5 from 1956 on into the early eighties, and via syndication in other markets in the United States. And of course how many Clevelanders got their first exposure to polka music thanks to Ghoulardi or Big Chuck and Lil' John? So perhaps there's still another documentary to be made on this subject. In the meantime, though, this one will serve well enough, flaws and all. 2 1/2 out of 4 stars.